A joint Australian-German research team led by Curtin University's Dr Christian Hirt has created the highest-resolution maps of Earth's gravity field to date—showing gravitational variations up to 40 percent larger than previously assumed. Using detailed topographic information obtained from the US Space Shuttle, a specialist team including Associate Professor Michael Kuhn, Dr Sten Claessens and Moritz Rexer from Curtin's Western Australian Centre for Geodesy and Professor Roland Pail and Thomas Fecher from Technical University Munich improved the resolution of previous global gravity field maps by a factor of 40. "This is a world-first effort to portray the gravity field for all countries of our planet with unseen detail", Dr Hirt said. "Our research team calculated free-fall gravity at three billion points—that's one every 200 metres—to create these highest-resolution gravity maps. They show the subtle changes in gravity over most land areas of Earth." The Earth's gravitational pull is smallest on the top of the Huascaran mountain in the South American Andes, and largest near the North Pole. "Only a few years ago, this research would not have been possible," Dr Hirt said. Watch the GGMplus making-of video and explore gravity over different parts of Earth. 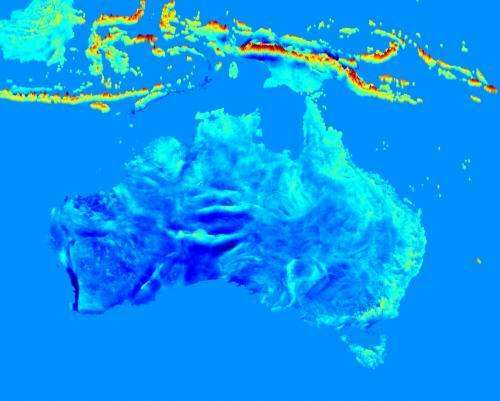 "The creation of the maps would have required about 80 years of office PC computation time but advanced supercomputing provided by the Western Australian iVEC facility helped us to complete the maps within a few months." "The maps can be used by surveyors and other spatial science professionals to precisely measure topographic heights with satellite systems such as the Global Positioning System (GPS)," Dr Hirt said. Dr. Genius Von Einstein, please explain gravity and why it is the weakest force. "with red indicating strongly positive anomalies and blue negative anomalies"
That should be: "with red indicating strongly positive anomalies and blue indicating negative anomalies"
I can't help but note that this map doesn't appear to be derived from any actual measurements of gravity. It is instead a model of what gravity would look like if the Earth's surface consisted of a substance of uniform density. But it is well known that there are subsurface features buried beneath relatively smooth Earth surfaces and entirely invisible from above that nonetheless produce distinctly different gravity anomalies from the surrounding area. It is my impression that the errors introduced by ignoring density differences would largely outweigh the benefit of achieving a resolution of 200 m using solely topography data. Hmmm...we all know sea level is affected by gravity, but now we find out that we don't know as much about gravity as we thought. Could it be we don't know as much about changes in sea level as we thought?? Could it be AGW is a total farce?? Gravity is not variable, Newton and Einstein are safe. All this means is the resolving power of our instrumentation is meeting very fine density gradients found in any fluid inhomogeneous thing (the Earth) that is dynamical. Gravity is not varying, the mass density varies. I could be wrong but, that's my take on it,,,, this doesn't seem like new science to me as much as it seems better and more precise measurements. Wow these mostly Australian 'researchers' are disgusting hypocrites. The European Space Agency has just spend enormous amounts of time and money to build a space satellite to map the actual gravity. They made world headlines with their super detailed earth gravity map. And now these clowns use data from mostly Nasa topography for almost free AND falsly pretend they make a gravity map. Their map is flawed exactly because it uses topografical data. Topography does not determine gravity as it's about types of rock and their density all the way down. That's why GOCE is an actual gravity mapper as it builds an actual gravity map by flying over all areas and making ulta precize measurements of the actual pull at each location over earth. This is like somone guessing a distance compared to somone actually measuring it.